Estimates vary as much as the applications of technology when it comes to just how much the liquid biopsy market will grow over the next few years. During March alone, Market Research Future projected no less than a $450 billion market by 2022, based on CAGR of 21.6%, while RNCOS offered a far more conservative forecast, estimating that sales of liquid biopsy tests will cross the $1 billion mark by 2020. RNCOS’ estimate is close to that of MarketsandMarkets, which last year predicted a $1.66 billion liquid biopsy market by 2021. 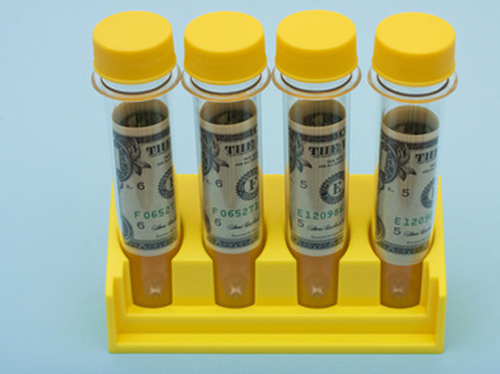 Looking a few years ahead, Grand View Resarch projects that market will rise to $5.96 billion by 2030, with assays for circulating tumor DNA (ctDNA) expected to account for the largest share of revenue. While tests differ, they can be grouped by sample type (usually blood and urine) and by technologies.In addition to ctDNA, other categories of liquid biopsies include circulating tumor cells (CTCs), and extracellular vesicles (exosomes). Liquid biopsies gained attention beyond the molecular diagnostics world last year when Bill Gates and Amazon.com CEO Jeff Bezos joined Illumina in committing more than $100 million to launch Grail, with the ambitious goal of developing a blood-based ctDNA screening test for the most frequent types of early-stage cancers. In January, Grail followed up by announcing it had raised $900 million toward a planned Series B financing of a cool $1 billion. Not surprisingly, Grail is among companies appearing on Clinical OMICs’ latest list, which counts down 10 privately-held diagnostics developers primarily focused on liquid biopsy tests. The companies are ranked by the total amount of capital they have raised, as reported by the companies in press releases or other public sources, such as investor presentations and news reports. The list includes only companies that are privately-held, as the value of public companies is determined through a different measure, namely market capitalization (price of stock times number of outstanding shares). Most Recent Financing Details: Company said July 26, 2016, it raised $9 million in Series A-1 venture financing, led by Artiman Partners and “several” undisclosed Taiwanese venture investors “who are committed to making a global impact,” including Acer founder and chairman Stan Shih. Proceeds: Scaling commercial operations of its portfolio of cancer blood tests, based on its rare-cell and genomic technology platforms. Most Recent Financing Details: Company on October 28, 2015, said it raised $21.4 million in Series A financing, led by New Enterprise Associates (NEA), with participation by new and existing investors that included Windham Venture Partners and Nanjing Kaiyuan Growth Capital Investments. Most Recent Financing Details: Company said January 26, 2016, that it completed its £31.5 million ($43.2 million) Series A financing with participation from existing investors Imperial Innovations, Cambridge Innovation Capital, and Johnson & Johnson Innovation–JJDC, as well as new investor Woodford Patient Capital Trust. Proceeds: Accelerate clinical studies to validate technology platform based on enhanced Tagged-amplicon deep sequencing (TAm-Seq), and commercialize the company’s first products. Platform will initially be applied across a spectrum of solid tumors, including lung, breast, and colon cancer. Most Recent Financing Details: Company said June 17, 2015, that it completed a $25.5 million Series B financing led by Livzon Pharmaceutical Group, with participation by Greenwoods Private Equity Funds and Syno Capital; as well as a concurrent $10 million joint venture with Livzon. Proceeds: Advance clinical development and commercialization programs. Most Recent Financing Details: Company said March 1 that it raised $65 million in Series A financing led by Andreessen Horowitz, which joined two other investors in Freenome’s seed financing, Data Collective (DCVC), and Founders Fund, as well as new investors GV (Google Ventures), Polaris Partners, Innovation Endeavors, Asset Management Ventures, Charles River Ventures and Spectrum 28. Proceeds: Expand clinical trials, accelerate research, and bring disease screenings to market. Most Recent Financing Details: Company announced final close of $60 million Series B financing on January 7, 2016. Participating investors included Series A co-leaders Forbion Capital Partners and NGN Capital, as well as CD Ventures and new investors, Qiagen, Arcus Ventures, Tiger Management and Blue Ridge Capital. Proceeds: Support the growth of its commercial diagnostics, regulatory, and companion diagnostics divisions, as well as the development of potential new diagnostic tests outside of oncology, such as in neurodegenerative diseases, and expand the development of its protein biomarker programs. Most Recent Financing Details: Company said January 5, 2016 that it raised over $40 million in a Series E financing. Investors included IBM Watson, Pathway’s partner in developing a mobile health application using artificial intelligence to provide personalized health and wellness guidance. Proceeds: Enable the company to expand its presence in the U.S. and beyond the 40 countries it currently serves. Includes: $22 million Series F (February 24, 2016); $38 million Series E (Completed June 23, 2015; funds raised 2013-2015); $20 million debt financing (January 2014); $40.8 million Series D (Completed April 12, 2013; funds raised 2011-2013); $7.1 million Series C and $1.4 million grant from the Qualified Therapeutic Discovery Program (November 5, 2010); $10 million Series “B-1” (September 28, 2009); $8 million Series A (August 20, 2008). Most Recent Financing Details: Company said February 24, 2016, that it completed $22 million Series F financing consisting of preferred stock and other securities, with existing Biodesix stockholders providing the majority of the new capital. Proceeds: Support ongoing development of new products, including new diagnostic tests for clinical use with immunotherapies, continued expansion of the company’s commercialized tests, VeriStrat® and GeneStrat™, R&D relating to the drug ficlatuzumab, and other general corporate purposes. Most Recent Financing Details: Company raised $82.844 million toward $100 million Series D financing, according to Form D filed March 25, 2016 with the U.S. Securities and Exchange Commission. The Series D—which includes equity financing and a term loan facility—was led by OrbiMed, with participation by existing Guardant Health investors Khosla Ventures, Sequoia Capital, Lightspeed Venture Partners, Pejman Mar, Formation 8, Heritage Group, and other unnamed investors. Proceeds: Support technical and commercial development of Guardant360®, which the company says is the world's first comprehensive, non-invasive genomic sequencing test for cancer; Further expand Digital Sequencing™ platform into new product lines that address the complete cancer-care continuum. Proceeds: Support continued product development and validation of blood tests for early-stage cancer detection, including the previously announced Circulating Cell-free Genome Atlas study and other large-scale clinical trials that are expected to enroll hundreds of thousands of patients; Repurchase a portion of the stake in Grail held by Illumina, which now owns “slightly less” than 20% of the company.